A consortium between Bombardier Transportation and Alstom have signed a framework agreement to deliver up to 1,362 M7 double deck cars to the Belgian National Railways (SNCB-NMBS). The order is worth 3.3 billion in total; 2.1billion of which Bombardier will receive, while Alstom will receive 1.2billion. The first stage of the order requires the design and construction of 445 cars, with an option to add up to 917 cars in addition, and is worth approximately 1.3 billion. The units will be delivered between September 2018 and 2021. Bombardiers share of this part of the contract is valued at 787million, while Alstom will receive 471million. Bombardiers Bruges site will manufacture 65 multifunctional steering cars and 290 trailer cars. Alstom will design and manufacture 90 motorized cab cars in its Valenciennes site in France, with the backing of its electrical and signalling centre of excellence in Charleroi. Alstom will also develop, manufacture and install the ETCS level 2 system to equip the entire fleet. This framework contract for almost 1,400 double deck coaches will provide the people of Belgium with the highest standard of modern mobility solutions. It also confirms SNCB-NMBS trust in Bombardiers products and technology, further strengthening our long term partnership. This order clearly reflects the strong confidence the SNCB-NMBS has in our double-deck trains and the level of comfort they offer. It is also an indication that the vehicles are really appreciated by the passengers and represent the ideal answer to increasing ridership. The new trains will increase capacity on SNCB-NMBS network by 145,000 seats. 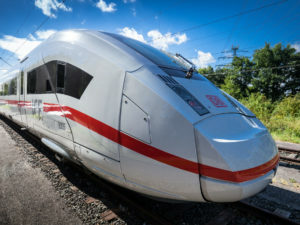 The trains will be capable of running at speeds of up to 200km/h and are able to run on all Belgian mainlines and some high speed lines, as well as cross-border to the Netherlands and Luxembourg. The M7 concept is based on M6 double deck cars, of which 492 were previously supplied by a Bombardier Alstom consortium. The interior has been completely redesigned in both first and second class cars following a customer consultation with more than 200 representative user groups. The passenger information system has also been upgraded, as has passenger comfort. The multifunctional steering cars will all provide wheelchair access and space for bicycles. The M7 cars are adaptable and may be operated either as M7 EMUs or as loco-hauled trains with either M7 and existing M6 double deck cars. It also boasts a predictive train diagnostic system to enable preventive maintenance thus reducing life cycle costs. These additional features make these trains one of the most cost-effective units on the railroads.